The term “expressionism,” as applied to painting, became common in the nineteenth century in Paris. Due to war and industrialization, people in the late 19th and early 20th centuries felt dehumanized in unacceptable ways. 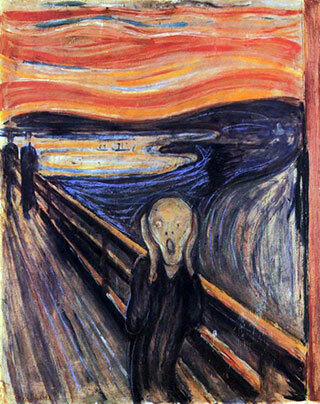 Expressionist artists expressed this intense shock visually through distorted images of nature and the human form. They were motivated by the brutal truth and degraded worldliness, instead of beauty and serenity. These artists did not intend viewers to appreciate their paintings as aesthetically pleasing fine art, but to be drawn in by their emotional content. Although every great painter has an individual style, the work of the expressionist artist is more intense because he moves away from representing the world around him and towards representing his inner soul. Expressionist paintings may appear spontaneous and free flowing, but they are carefully calculated. 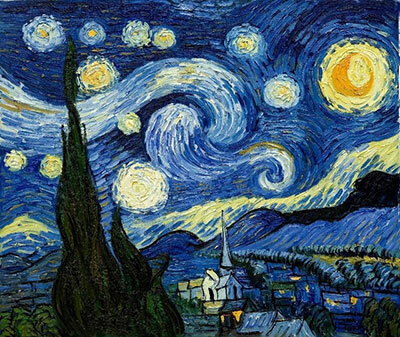 For example, in Vincent Van Gogh’s Starry Night, the artist transforms the realistic view of the stars and moon to a scene with a gushing force moving through the sky. This force is the energy the artist feels when gazing at the bright night sky. The artist tries to make the viewer experience the feelings associated with the view, not the actual view. Some years later Tyeb Mehta (1925-2009), a member of the Bombay Progressive group, would be led to paint in an expressionist style after bearing witness to the cruelty of post-independence partition. During his stay at Lehri House in Mohammed Ali Road in 1947, he was an eyewitness to the violent stoning death of a man by a mob. This disturbing scene had a lasting impact on him and influenced some of his most accomplished paintings. 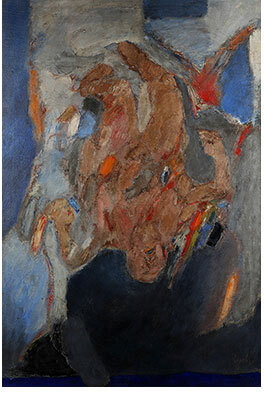 In Falling Figures (1999), for instance, Mehta uses the falling figure to express his emotions regarding humanity falling into darkness due to violence and hatred. The general public is often prevented from entering the artist’s world by the puzzling and intense emotions of the artist, which are personal and clear to the artist, but not necessarily to the viewers. In expressionist paintings, the artist achieves his craving to express his inner world and moods. The enjoyment that these works stir in viewers is directly connected to the emotions of the artist and his ability to express them visually.